It was ‘Oh What A Night’ to remember when more than 200 people enjoyed a sold out night of music at Edgware & Hendon Reform Synagogue (EHRS) on Saturday 23 March, as Bonnie Lemer explains. 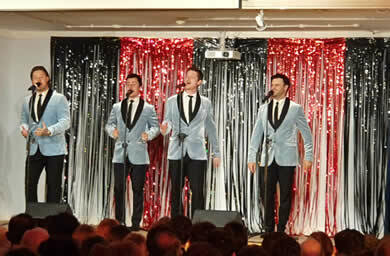 EHRS welcomed The Jersey Four, a tribute to Frankie Valli and the Four Seasons. With brilliant vocals and dance routines, it was hard to keep seated throughout the vibrant performance. There were many people singing and dancing in the aisles to the classic Valli tunes with a drink and ice-cream in hand. A wonderful evening was had by all, and it certainly had us ‘Beggin’ for more.